Sara Duterte calls for Hontiveros’ resignation: Wala ka na sinabing tama. Lahat sablay! Davao City Mayor Sara Duterte has called for the resignation of Senator Risa Hontiveros over her alleged epic fail statement linking Public Attorneys’ Office chief Persida Acosta to the measles outbreak in some parts of the country. “Ikaw dapat ang magresign dahil wala ka na sinabi na tama. Lahat sablay,” The President’s daughter wrote on Instagram, reacting to a news report about after Hontiveros asking Acosta to resign. 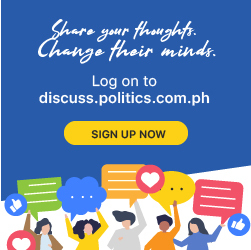 The Senator has criticized the PAO Chief for alleged “scaremongering” during her “politically-motivated investigations” on Dengvaxia that contributed to the erosion of public trust in vaccination programs. Duterte however defended Acosta from the senator’s attacks, saying the PAO chief was just doing her job in helping indigent families who want to sue over the Dengavaxia controversy. “You can easily verify this if you talk to the people in the barangays instead of putting your head inside your behind all the time. Do not wag the dog,” she told Hontiveros. She advised critics to present solutions to the problem instead of just voicing opposition. “Kapag gusto natin magsalita pag-isipan muna para hindi nakakahiya,” she said. Ikaw dapat magresign dahil wala ka ng sinabi na tama. Lahat sablay. PAO Chief Acosta is doing her job in assisting indigent litigants who want to sue. Dengvaxia eroded the parents' confidence in vaccines and you can easily verify this if you talk to the people in barangays instead of putting your head inside your behind all the time. Do not wag the dog. Devangxia killed innocent individuals, bakit wala ka human rights angle dito? Paano masolutionan ang outbreak sa pagpapa resign ke Atty Acosta? Mag isip po tayo ng solution, hindi opposition para lng may masabi. Kapag gusto natin magsalita pagisipan muna para hindi nakakahiya. Hilbay questions Locsin’s defense of boorish Chinese: Kung si Sister Fox dineport agad, ‘yung bastos kinampihan pa!